The image of Lionel Hollins putting his hands up to his face and not choosing to look at his Nets as they were run out of Barclays Center by the Atlanta Hawks will be the one Brooklyn fans take into the off-season. Indeed, the Nets were very much an unwatchable team in 2014-15, even if they did sneak into the playoffs. Once they got to the post-season, they won two games, had chances to win three others against a top-seeded Atlanta team that hardly played like a 60-win team, and ended up finishing the season at 40-46. Yes, another very disappointing campaign for a team boasting an $88-million payroll. For the second straight season, they didn’t live up to their paychecks. Now what? There’s not a lot of wiggle-room for a franchise that unwisely put itself in a straitjacket by dealing all of its own No. 1 draft picks until 2019, and again will have to carry the big-ticket contracts of Joe Johnson and Deron Williams into another NBA season. Williams had one shining moment against the Hawks, scoring 35 points in the Nets’ Game 4 win. Other than his one standout performance, he was a poor performer and non-factor -- averaging 11.8 points on 39 percent shooting for the series. For his part, Johnson did nothing to make teams want to call GM Billy King and start making offers. In a lot of ways, the team across the East River, dysfunctional as the 17-win Knicks are under Phil Jackson, have the chance to get things turned around a lot more quickly than Mikhail Prokhorov’s team. They have two assets the Nets sorely lack: A No. 1 pick that could be No. 1 overall in the lottery and $30 million in cap space to spend on free agents. Hollins will be back for his second season and it promises to be better than his first campaign in Brooklyn. He was too late figuring out what his players could do and couldn’t do. He probably should give thanks that he now operates in the East, where even if it takes 65 games to realize that you can’t pound the ball into Brook Lopez like he did in Memphis with Zach Randolph, your team can still make the playoffs. Hollins disappointed us with his post-game tribute to his team, throwing bouquets when the Nets hardly accomplished what they had set out to do. But at least they won’t go through another coaching change as they try to figure out how they can get better if they are forced to come back with essentially the same team next season. Which probably is the case. We don’t think there can be a lot of building done with this group, even if free agents Brook Lopez and Thaddeus Young choose to return, as expected. The old problems aren’t going away. There’s no leadership on the court. The lack of togetherness is apparent on many nights. 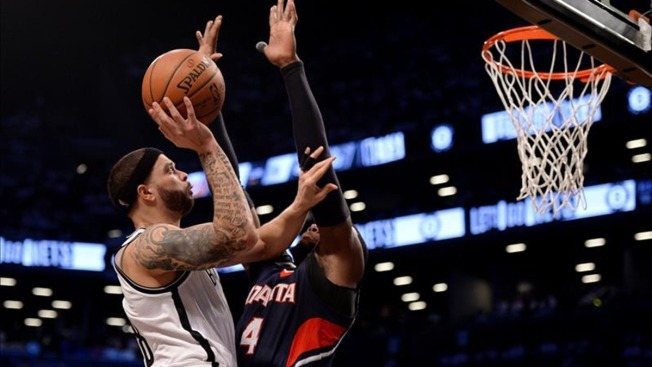 The team often lacks heart and there are too many games when the lack of talented, young athletes puts the Nets at a distinct disadvantage when they take the court. They just got done playing a team that hardly looks like world-beaters, but at least the Hawks provide a blueprint of how the Nets should play. They took a step back after going to the second round last spring. The absentee billionaire owner, Mikhail Prokhorov, vowed that he’d force himself to give up bachelorhood and take a bride if his five-year plan to win the NBA title didn’t come to fruition. The Nets fell short, but what else is new?